சின்னஞ் சிறு கிளியே - கண்ணம்மா! என் கண்ணிற் பாவையன்றோ? - கண்ணம்மா! And came to this world to improve it. Not translated it but retained it. So that I will take and hug you. My mind shivers in pleasure. My soul belongs completely to you. Would avoid my barbarous nature. In giving love to me. For wearing in the chest. For living a life of plenty? 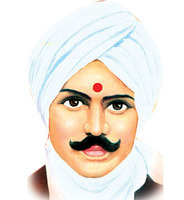 We are glad to share the famous Bharathiyar Song "Chinnaj Chiru Kiliye". In this song the Poet sees Goddess Parashakthi as a child. Enjoy the Lyrics and the Music which is shared here.